It’s not what you know but who that really counts. Norman Oppenheimer, the indelible title character of Joseph Cedar’s new movie, lives by these words. Played by Richard Gere, under a heavy overcoat he never seems to remove, Norman is a nobody hell-bent on becoming a somebody, mostly by talking the ear off of everybody. 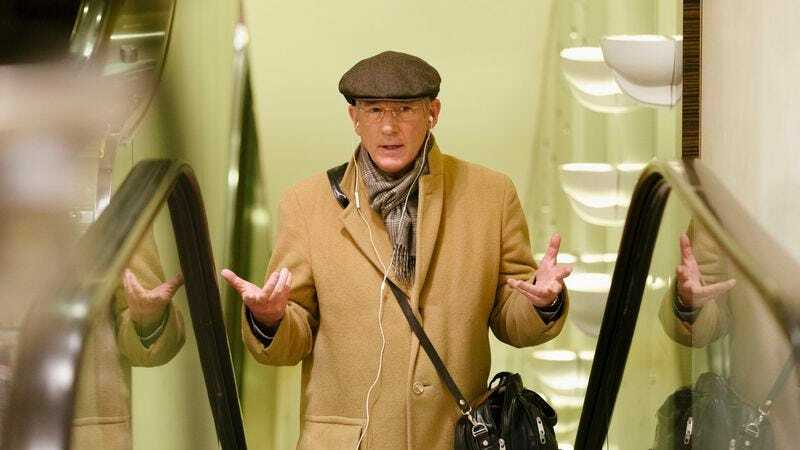 Immune to embarrassment, he hovers around the outer edges of New York’s most affluent Jewish circles, working angles and arranging meetings through sheer overbearing persistence. Norman calls himself a businessman (and has the card to prove it), but his only business is networking. And he fancies himself a fixer, the guy who can get you a seat at any table (his favorite line is some variation on “You should let me introduce you”), but his connections are tenuous at best. “You’re like a drowning man trying to wave at an ocean liner,” says his attorney nephew (Michael Sheen) when Norman comes to him in the opening scene, begging for a contact. “But I’m a good swimmer,” Norman retorts. It’s a funny way to describe keeping your head just above water. In a sense, what we’re watching is a classic con-artist movie, built around someone who plies his shady trade not for money but esteem—the feeling that he matters, that his name carries weight. For a while, Norman seems content cataloguing the character’s failed ventures; there’s a painfully funny early scene where he crashes a swanky dinner party, promising a VIP that never shows up, and is promptly shown the door. Eventually, however, this gregarious bullshitter reels in his big fish: an Israeli diplomat named Eshel (Lior Ashkenazi) who is visiting New York during a low point in his political career. Smelling an opportunity, Norman essentially stalks Eshel to an upscale men’s clothing store, where he buys the stranger an expensive pair of loafers he’s been eyeballing. For Norman, this is a strategic investment—a way to get, as the act title puts it, his foot in the door. But Eshel, wounded by his professional woes, is deeply moved by the gesture, taking Norman for a mensch. And when, a few years later, the politician has risen, impossibly, to the seat of prime minister, Norman becomes a film about what happens when a small-time wheeler and dealer successfully bluffs his way to the big time. Cedar, too, has increased his influence. This is the Israeli writer-director’s English-language debut, and he takes the opportunity to assemble an ensemble of name actors, each playing a strand—a testy rabbi (Steve Buscemi), a business giant (Harris Yulin) and his irritated assistant (Dan Stevens), an Israeli investigator (Charlotte Gainsbourg)—on the web of quid pro quo arrangements Norman ends up weaving. All the same, this isn’t some big departure for Cedar. Like his last movie, the Oscar-nominated Footnote, it’s an intelligent, adult drama that moves like a comedy, in which a man desperate for acceptance and approval becomes tangled in the inner workings of an Israeli institution—the government this time, instead of Talmudic studies. (Ashkenazi, now clean-shaven, played a key role in Footnote, too.) Cedar also again can’t resist jazzing up his talky, highbrow material with stylistic flourishes, here depicting Norman’s glad-handing ascension in the social ranks as a long montage of disembodied heads, like the ghosts of a noir dream sequence. As in Footnote, such tactics can feel as ingratiating (and insecure) as Norman himself. Cedar might have been better off just trusting his material—and his star. This is one of Gere’s best performances, somehow both transparent and opaque: Following the lead of the script, which remains deliberately vague on biographical details, the actor shows us nearly suppressed glimpses of the loneliness and desperation that drives Norman, without letting the man’s mask of good-natured confidence ever slip. 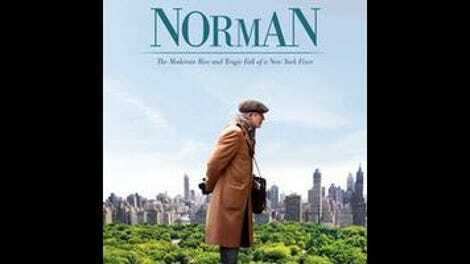 There are, as it turns out, consequences to Norman’s social salesmanship, his pathological need to play the most connected man in the room, and they’re teased by the film’s original subtitle, The Moderate Rise And Tragic Fall Of A New York Fixer. Of course, for a lifetime scammer like Norman, just trying to make his glowing self-image a reality, the most moderate rise is worth the most tragic fall. He’d gladly drown if it meant looking like the best swimmer for even a minute.